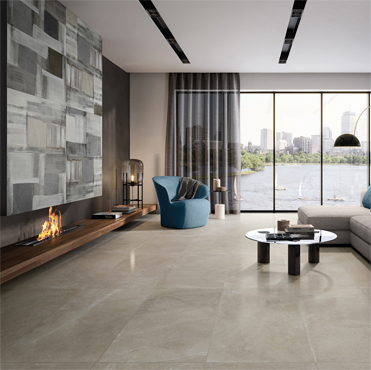 Sassuolo, 9 April 2019 - Large ceramic slabs for architecture and furnishings, collections of surfaces for floors and walls for residential, commercial, and public projects, for indoor and outdoor environments, even with a thickness of 20 mm. 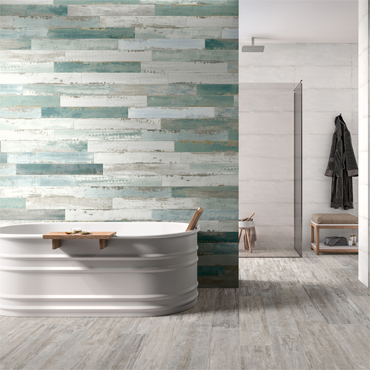 The participation of the Fincibec Group at Coverings 2019 focuses on the full range of ceramic solutions that the manufacturer offers to planners and interior designers to respond to the variety of styles and requirements of modern construction. In Orlando (Florida) from 9 to 12 April, the public of sector professionals and distributors will find a wide range of slabs from the FIRE and OVER catalogues at booth 1725 in the Italian Pavilion, from the group's companies specialised in the production of large sizes in 160x320 cm and 120x260 cm. Increasingly widespread and appreciated, ceramic slabs are exquisite elements for customizing interior spaces, and are ideal for creating furnishing elements and accessories to coordinate with the overall style. Tradition, Evolution and Graphis are three new offerings by Monocibec that bring attention to the stylistic research linked to the evolution of interior design trends. Tradition offers a classic and elegant vision of natural stone, while Evolution superimposes the graphic variability and elegance of the veining of the material from which it takes inspiration over the compactness of industrial cement, offering an evocative and versatile result. Graphis is a worn interpretation of cement, scratched and marked by time and wear, to become an exclusive, one of a kind surface. The Century line grows with the new Fusion project, with a fresh and up-to-date beauty that embodies the solidity of cement and colours inspired by the eclectic appeal of metals. Alongside it is the Glam collection, inspired by natural stones with a more compact and homogeneous look, yet full of details and offered in five understated and refined colours. Monocibec and Century have also expanded and updated their range of 20 mm thick products with grip surfaces, Major and TWO, for the design of outdoor spaces. Naxos confirms itself as one of the most creative brands in the ceramic world, and presents Fresco, its first collection entirely made in fine porcelain, with a thickness of 7 mm. Fresco offers a colour range inspired by the glorious era of the Italian Renaissance, through an exclusive aesthetic that finds balance between ancient and modern, and features small, unrepeatable imperfections that are also found in masterpieces of art. The know-how of Naxos linked to the production of white tile is expressed in Belleville project, with its bohemian flavour linked to the world of minor arts and decorative craft techniques, and Shiny, which offers refined colours and exquisite decorative solutions that meet the most current trends in bathroom furnishings and kitchen design.